Six days ago, Marca published an article saying Liverpool had made an offer for Iker Muniain. They weren’t the only ones, with Napoli said to have done the same. 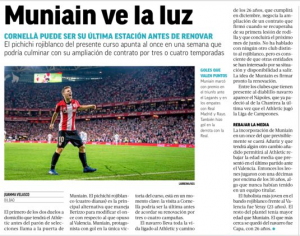 Given Athletic Club Bilbao wouldn’t listen to any offers anyway, and with Muniain’s contract expiring in June of next year, the offers will have gone to the player and his environment. However, Monday’s edition of the same newspaper may contradict their own story. It’s stated Muniain is close to renewing, a preference both of the articles contained. Napoli interest is mentioned, but there’s no reference to Liverpool. The footballer hasn’t spoken to any other clubs, but is aware there’s interest from elsewhere with sides wanting to know his transfer intentions. Therefore, either Liverpool’s offer was indirect, and there’s been no direct Muniain talks, which wouldn’t be so unusual, or it never happened and Marca have forgot to include the claim in their latest article. Either way, the consensus is that Iker Muniain is leaning towards a renewal. Football news from world media. Coverage of European and World newspapers.